Although fish possess both the requisite “architect genes,” Hoxa and Hoxd, as well as the regulatory structures needed to produce either fins or limbs, these elements never work together in fish the way they do in four-limbed land animals. Fins, it would appear, are not quite analogous to limbs. What’s more, as indicated by an investigation of three-dimensional DNA organization, successive waves of evolution in land-colonizing organisms essentially retrofitted pre-existing genetic elements—the ones present in both finned and limbed animals—giving rise to structures such as wrists and digits. These results, generated by scientists at the University of Geneva (UNIGE) and the Ecole Polytechnique Fédérale de Lausanne (EPFL), suggest that the first organisms to claim the land by hauling themselves out of the muck had something of a helping hand, genetically speaking. Then, having secured their footing, these organisms proceeded to elaborate upon their inherited gifts. The scientists, led by UNIGE’s Denis Duboule, compared the structure and behavior of Hoxa and Hoxd gene clusters in embryos from mice and zebrafish. To their surprise, the scientists found that the bimodal three-dimensional chromatin architecture in the Hoxd gene region in the mouse was similar to that in the fish. This finding indicates that the regulatory mechanism used to pattern tetrapod limbs probably predates the divergence between fish and tetrapods. 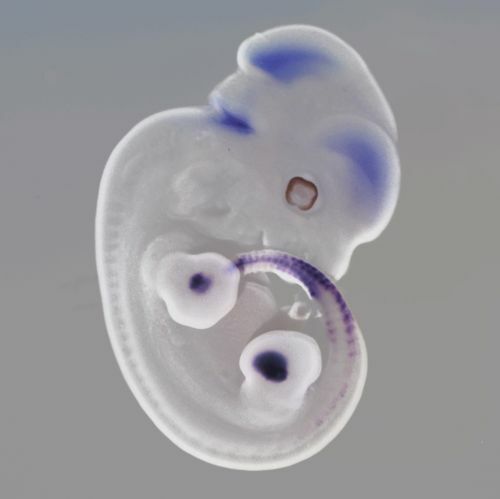 Next, the scientists inserted the fish Hox genes into transgenic mouse embryos. Subsequent study revealed that these genes were active only in the mouse arm, but not in the digits—apparently fish DNA lacks essential genetic elements for digit formation. “Altogether, these results suggest that our digits evolved during the fin-to-limb transition by modernizing an already existing regulatory mechanism,” noted Denis Duboule. “A good metaphor for what has probably happened would be the process of ‘retrofitting,’ as is done in engineering to equip outdated machine frames with new technology. Only, in this case, it was a primitive DNA architecture which evolved new ‘technology’ to make the fingers and toes,” added Joost Woltering, a UNIGE scientist on Duboules’s team. According to this model, the authors continued, a bimodal “proximal–proximal” patterning system in fins (without mesopodium) evolved into a bimodal “proximal–distal” system in limbs, one including an articulation. This model, then, postulates the transformation of a regulatory landscape from a “proximal” to a “distal” specificity.